Those who live vicariously through Indiana Jones will be glad to know that a team of Israeli archaeologists has uncovered a cryptic message left on a 3,000-year-old pottery shard. The ink-on-clay piece of pottery—called an ostracon—was originally discovered in the 1960s, in a city west of the Dead Sea called Tel Arad. Now, using new technology in multispectral imaging, researchers at Tel Aviv University have been able to illuminate text that’s been hiding on the ostracon all these years. Thousands of years ago, Tel Arad was a military outpost, so it makes sense that the “front” of this particular ostracon detailed military finances. The back, however, appeared blank. 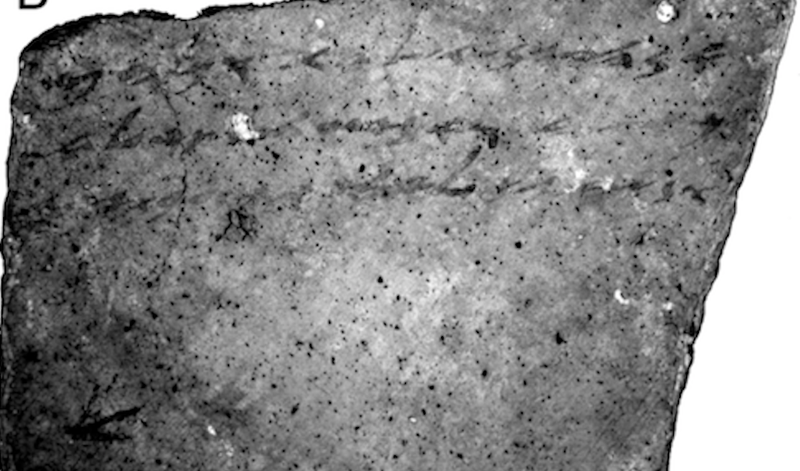 But after revisiting the ostracon using experimental multispectral imaging techniques, the team at Tel Aviv University was able to show the reverse was full of text—and like all good messages, it was about wine. The team’s research, which has been published in PLOS One, details their unique method. They used a modified Canon SLR 450D digital camera and a Tamron SP AF90mm F/2.8 Di 1:1 Macro lens to photograph the ostracon in a dark room. “The internal Canon IR cut filter was removed by Lifepixel and replaced with transparent glass having the same refractive index,” the group wrote. Using an array of filters, the team was finally able to reveal the hidden message. Hopefully, this new technique can be used to read the hidden messages on other ostraca. Who knows what good biblical gossip we’ve been missing out on after thousands of years.